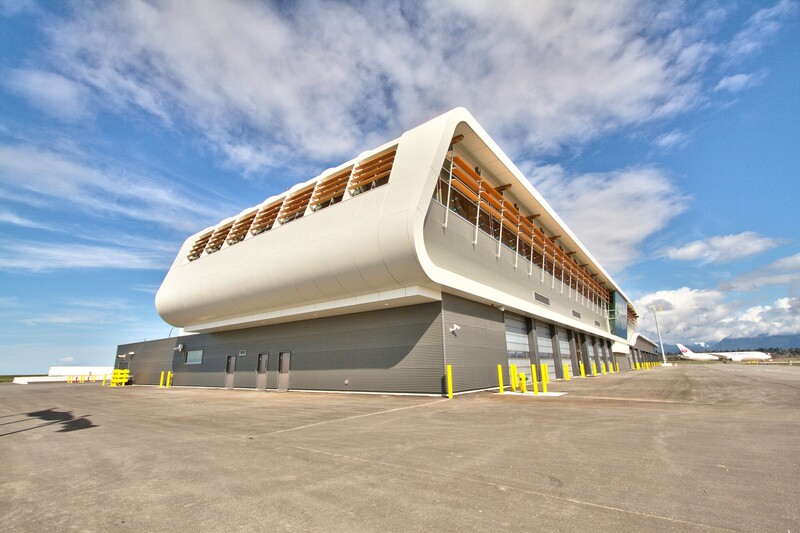 Many years in planning, the new State-of-the-Art AOB – Airside Operations Building at YVR is a highly specialized and unique facility centrally located on the airfield of the Lulu Island Vancouver International Airport. 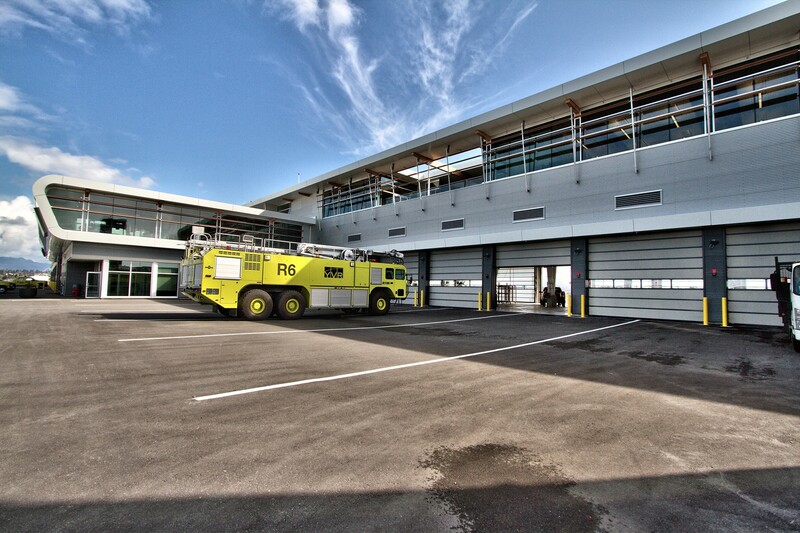 The centralized structure replaces the 40 year old fire hall and is the collaborative new home to all the airfield maintenance, heavy equipment mechanics, key airside operations personnel, and first responders, to ensure efficiency and to maintain a safe and secure airfield for passengers, employees and airlines. 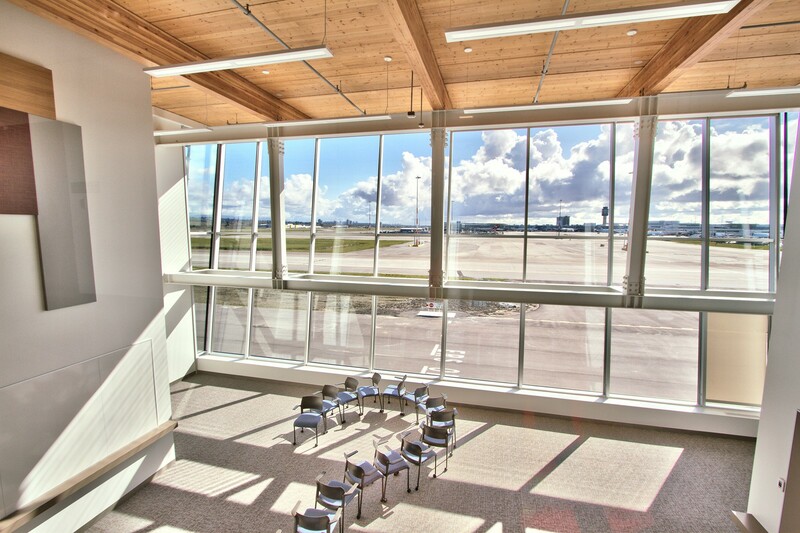 As of 2015, the AOB is certified as the “Greenest Building at YVR” which happens to be built on a “Bog-like” ground, which is unstable. 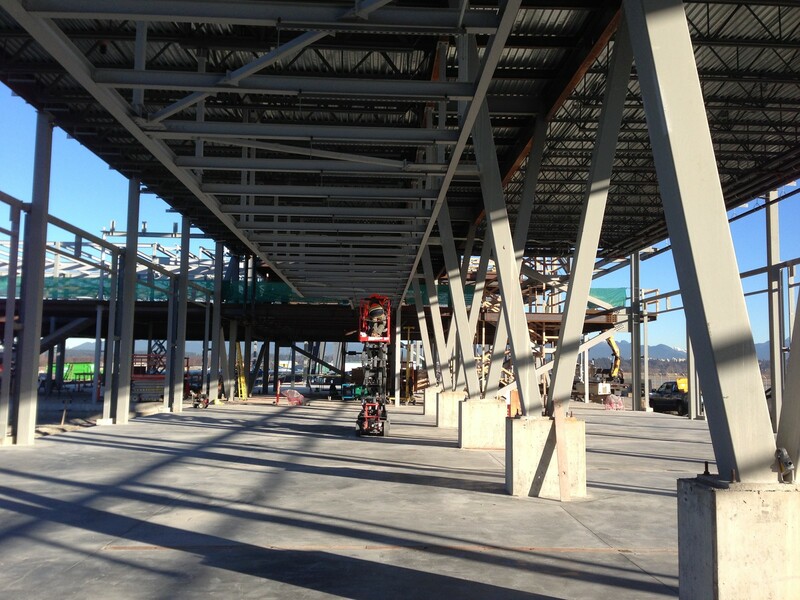 To prevent a heavy building from sinking, the YVRAA ownership team, Architects, and Engineers naturally selected steel as one of the primary construction materials for the operations and emergency response headquarters. A steel system was developed to counteract the soil instability and to provide a post-disaster and a seismically sound building solution. Moreover, the AOB design will simultaneously celebrate architectural expression, functionality and mission to reach beyond boundaries. For a comprehensive description of this project, click on the PDF link button. For a timelapse video, click on the TimeLapse link button. For additional project photos, click on the thumbnails below. 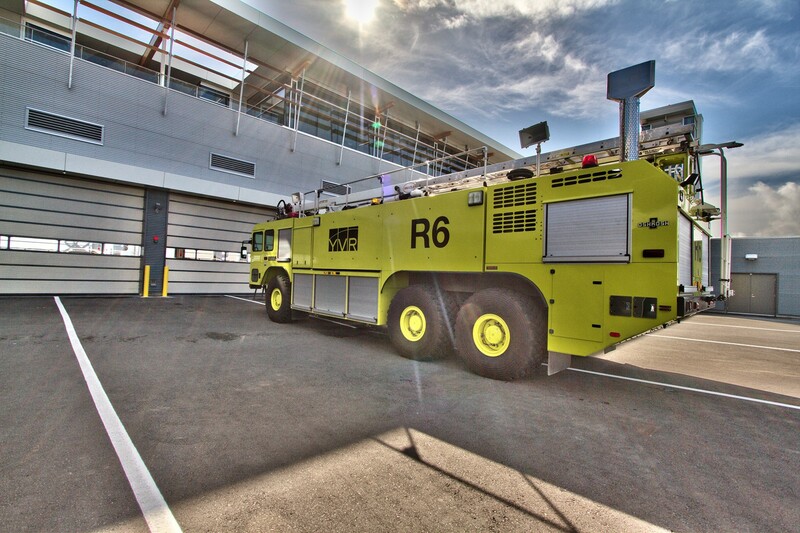 To assure the Airside Operations Building’s first responders that the immediate unstable surrounding areas and the continuous airline traffic remained at optimal safety and performance, it was critical that the design concept addressed these principle factors. Central to the entire airfield, the idea of a “light-building” was adopted at the onset of the planning with steel as a natural choice. The advantages of steel included strength, flexibility, predictability and its overall weight. 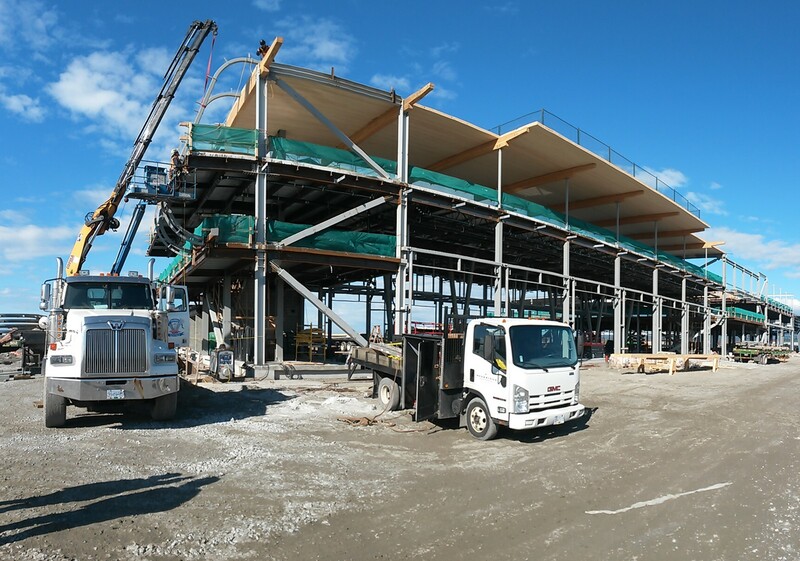 The resulting building’s solution has elevated the AOB to be a one-of-a-kind airport structure in North America bringing all the teams together into a one-airfield facility, enhancing overall safety and efficiency. In regards to land instability, the AOB Class F site utilized a “bracing-system” called BRB – Buckling Resistant Bracing. In-turn, the AOB is built as a “Raft-like” compound that embraces the environmental shifts of its foundation. The BRB system was implemented because it behaves similarly in compression and tension, is predictable, and reduces loads to the concrete foundation. 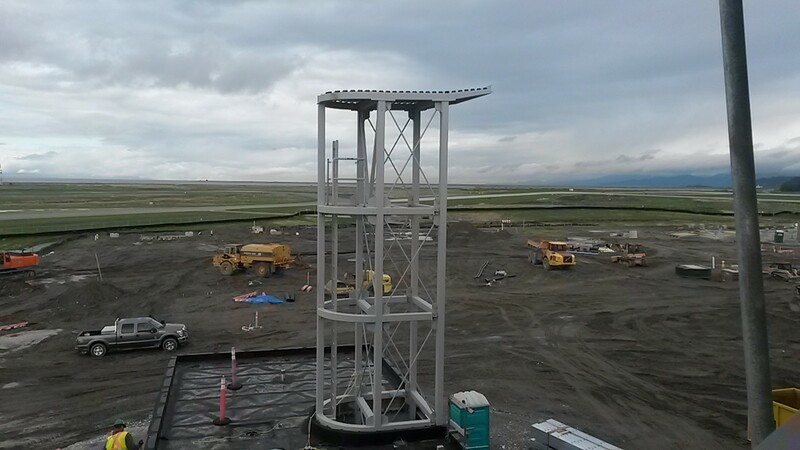 Beyond the issues of soil instability and the additional field installation obstacles, was a climate in constant flux, plus the fact that construction was done in the middle of an active airfield. At times, unpredictable weather such as heavy fog and high winds, has shut down the entire job site. 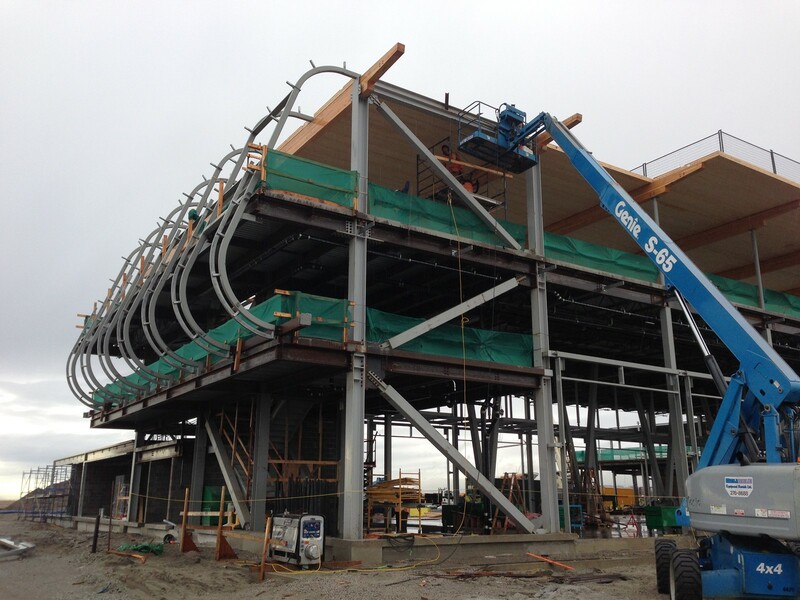 Unprotected from windstorms, extreme cold and the constant moisture of the Pacific Northwest slowed construction down. 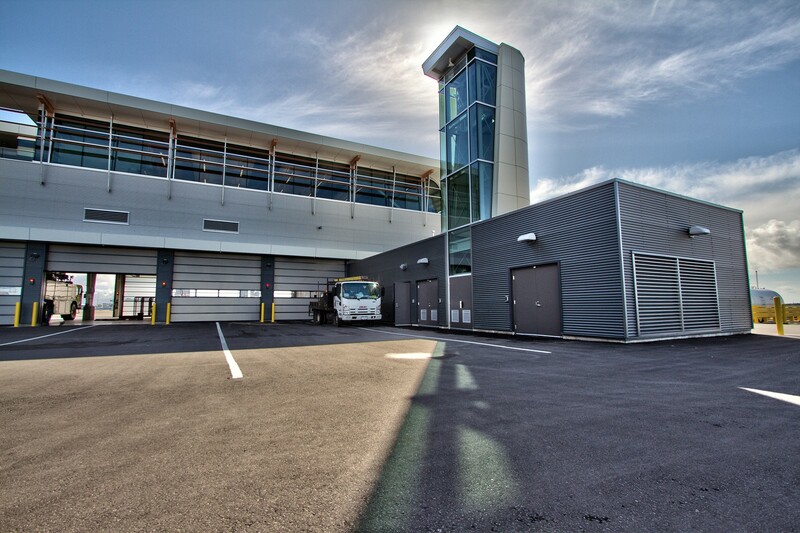 In the end, the Airside Operations Building rose to the architectural, engineering and environmental challenges presented, and through close collaboration and the celebration of individual strengths of all teams, the new facility has minimized the response time for emergency and disaster vehicles. Despite the evolving nature of design drawings, numerous site instructions, and weather delays during the construction phase, the teams met the budgetary challenges of the AOB. With many additions and add-ons to ensure security, effectiveness and environmental sustainability of the evolving requirements, the teams were able to adapt the designs on-the-fly and ensure the full contingency was not exhausted. 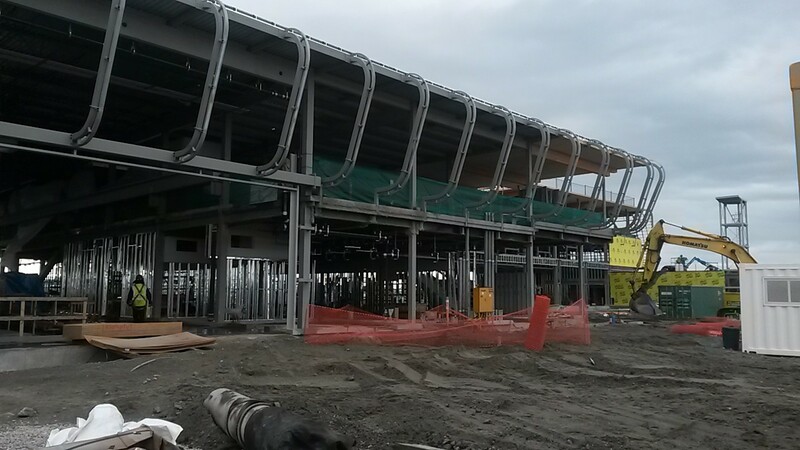 YVR’s new technology-forward and environmentally sustainable Airside Operations Building commenced construction during the summer of 2013. 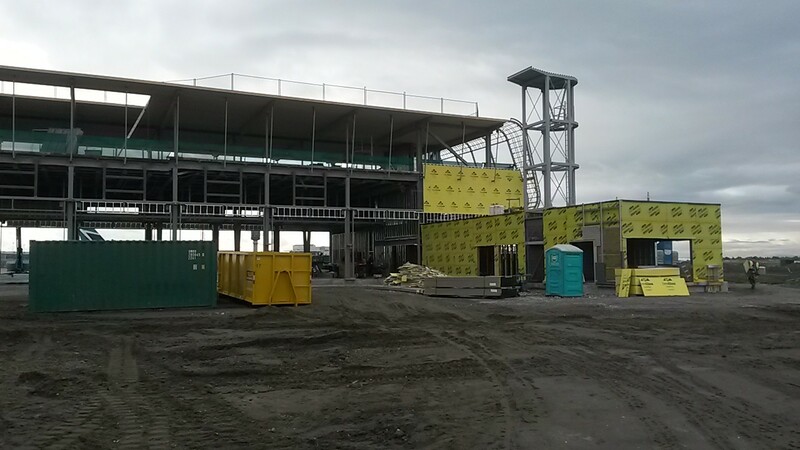 The first-of-its-kind integrated facility was completed on schedule in early 2015. The teams were on schedule in accordance to the timeline despite numerous challenges to the modeling, fabrication and erection process. How does the Structure Fit into the Surrounding Community and / or Environment? 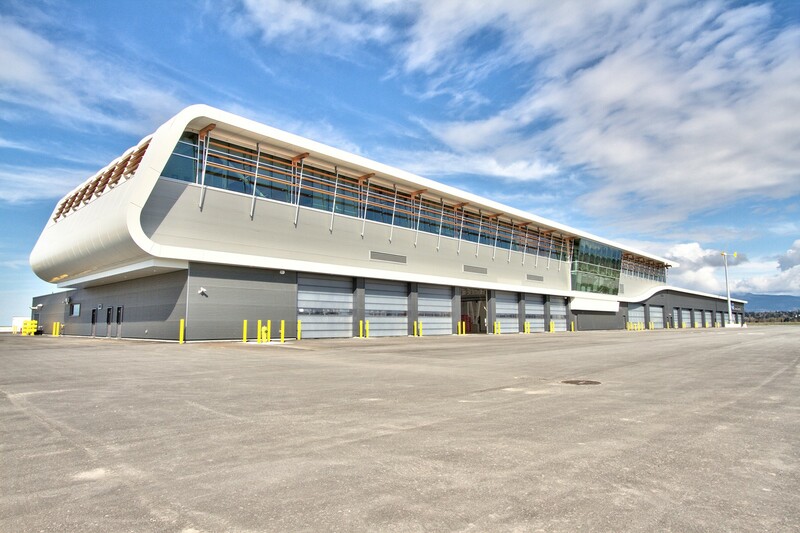 To improve the depth of collaboration and engagement, the YVR built a “complete community” in the heart of the Vancouver airfield. 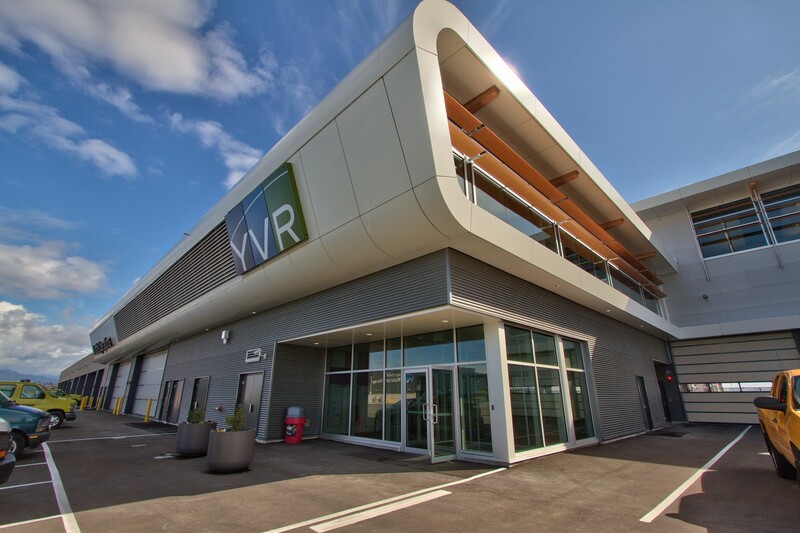 Airside Operations Building is the strategically placed home to key personnel who, with their skills, machinery and equipment, will service a dynamic and fluid environment of international travelers and airlines. 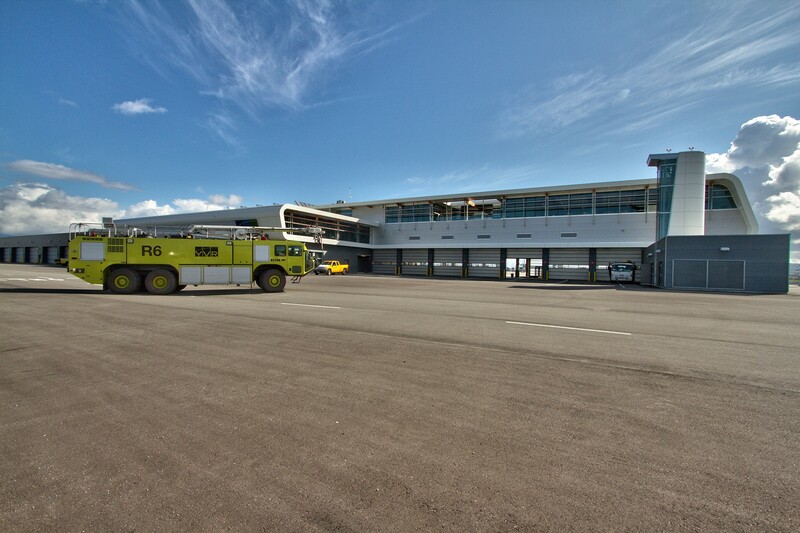 All airside maintenance activities and drills will be performed in this centralized environment which has also developed a comprehensive wild life control policy allowing AOB to be the first community in North America to incorporate all emergency elements. Possessing a true balance of architectural expression and streamlined functionality, the world-class facility is a groundbreaking and beautiful achievement. Steelworks contained the critical properties to represent the many curving structural elements of the façade. 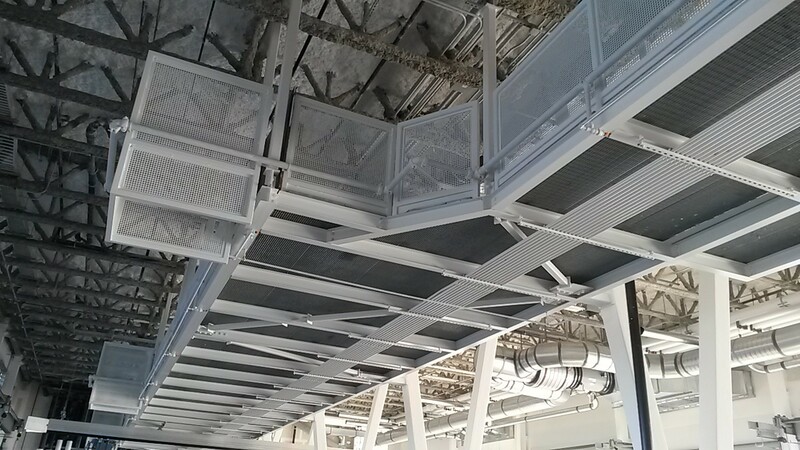 A suspended gangway for team members provided an uninterrupted pathway for emergency vehicles below. 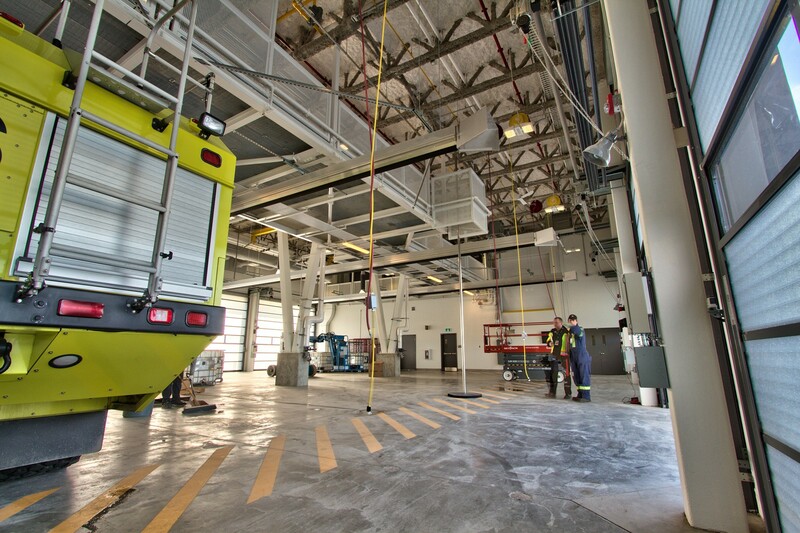 Eight thousand, six hundred twenty-six square metres in size, the AOB houses a new fire hall, maintenance bays, indoor parking garage, materials storage facility with emergency vehicle wash bays, and hose hangers along with a fuelling compound. 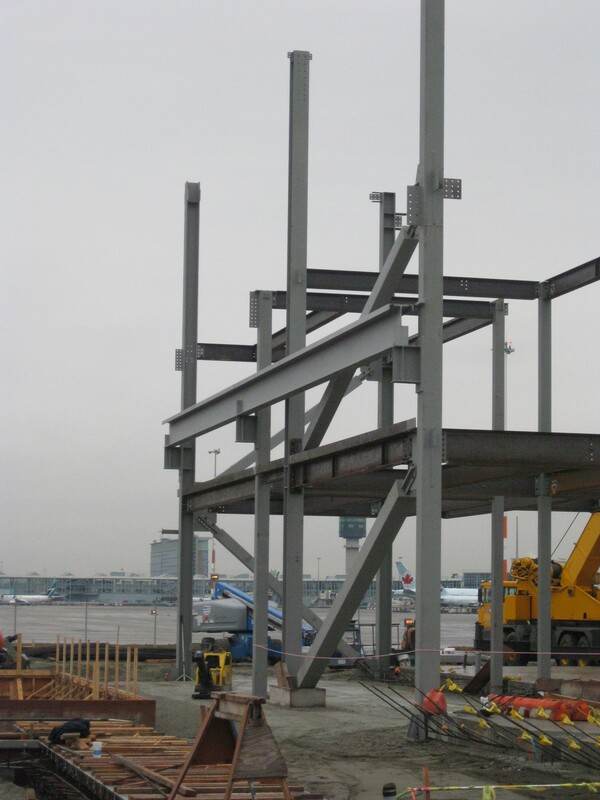 Due to the complexities of the air traffic’s environment and surrounding airfield soil condition, the need to build a “light steel building” was the backbone to the AOB’s engineering innovations. As a post disaster key design element, the “light-building” concept utilization of BRB – Buckling Resistant Bracing - technique was implemented to address seismic fluctuation and to stabilize the core foundation of the AOB. 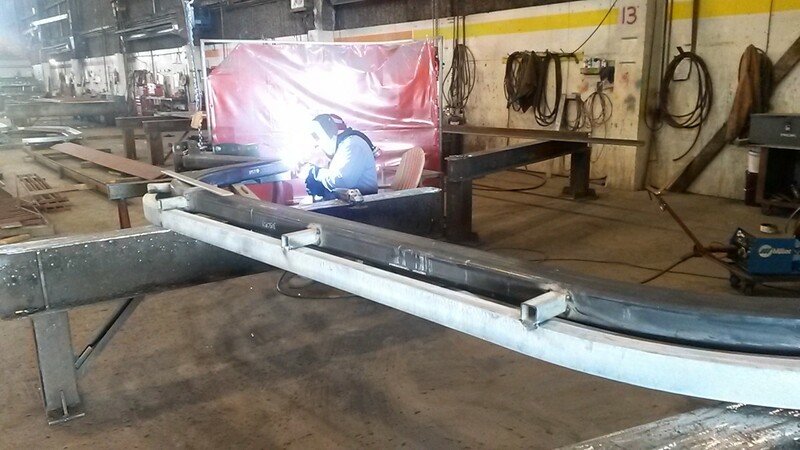 With vast quantities of flammable fuel on site and with emergency vehicles in constant motion, “welding flashes” resulting from steelwork assembly, had to be minimized. Airline pilots also required diminished “welding flashes” due to the distraction. 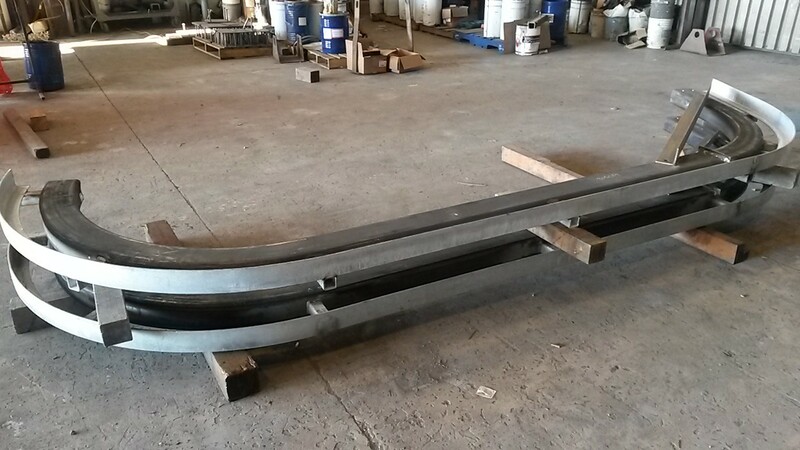 Therefore, an extensive bolted connection strategy was modeled and deployed. 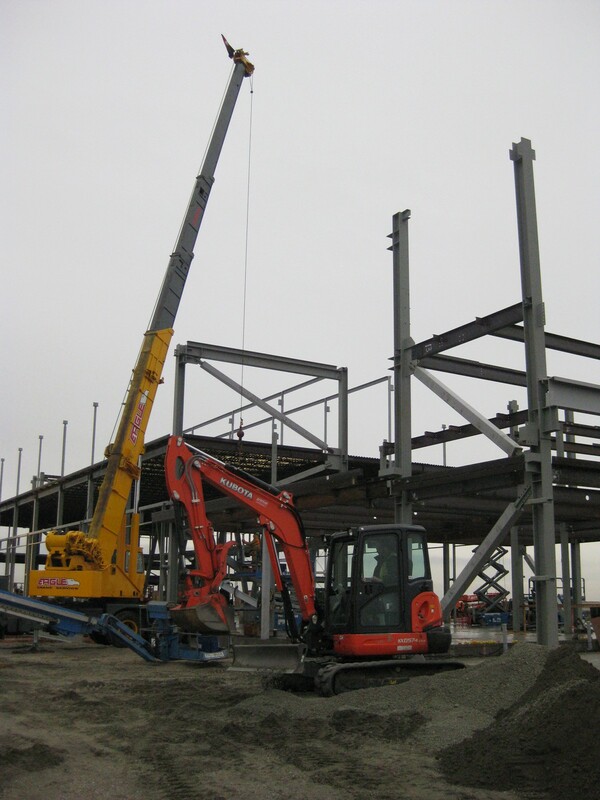 The utilization of bolts elevated the speed of on site assembly resulting in less work and more accurate controls. Using bolted connections also allowed teams to maintain a “flash-free” environment which in-turn heightened the safety and security of all personnel. 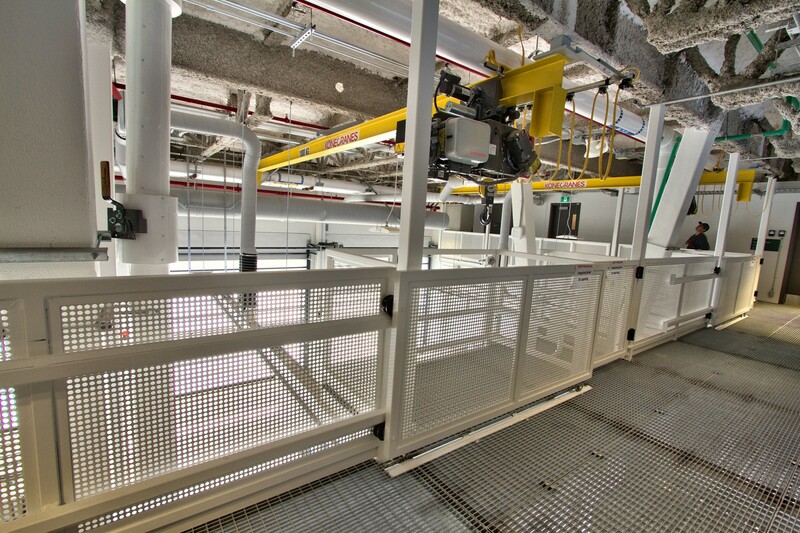 A suspended gangway allows emergency vehicles unobstructed access to the six entrance and exit bays with doors on both sides of the AOB, which in-turn streamlines vehicle movement and accelerates the response time to parties in need. 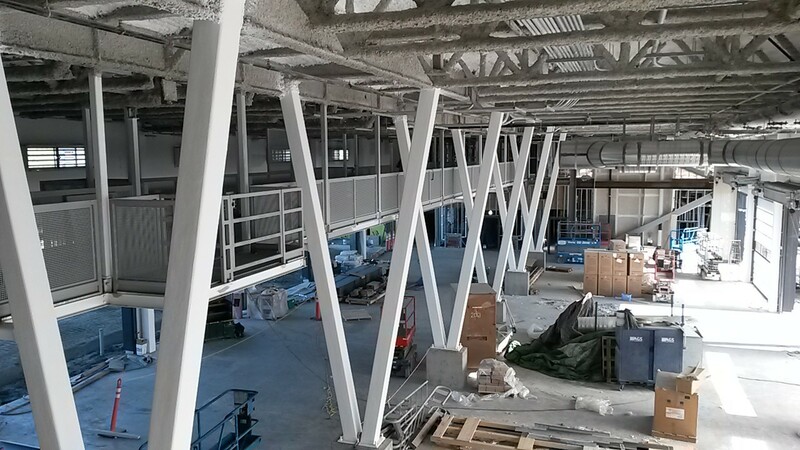 The AOB had many challenging engineering complexities to overcome including high seismic load restraint, structurally connecting multiple building materials as per design, ongoing coordination and changes for drafting and engineering alternations, in order to meet a tight timeline. 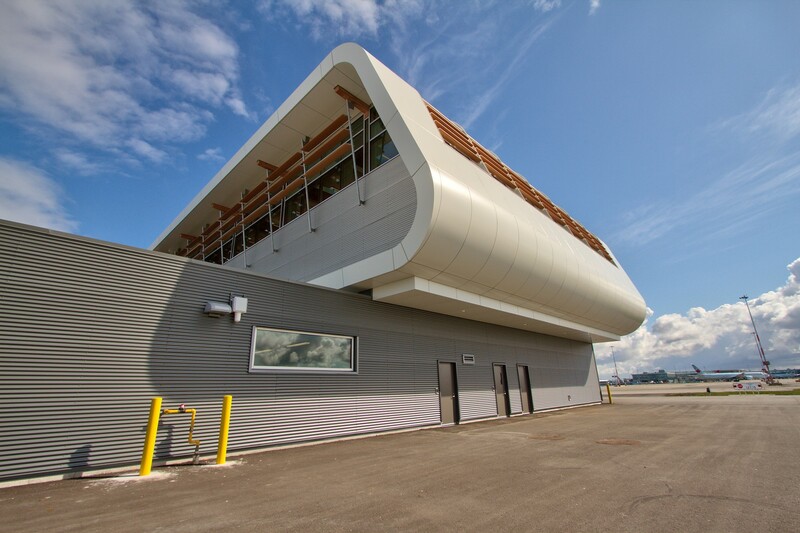 To continue to be “Awarded Best Airport in North America Five Years in a Row”, YVR’s Airside Operations Building needed each steel and engineering complexity to be thoroughly premodeled, prefabricated and implemented to the highest standards of architectural and engineering craftsmanship. Was it a LEED Project? From the onset, the AOB was meticulously planned with environmental sustainability as a core strategy boasting over 40% overall energy savings as compared to other standard buildings. Wind power is provided by an onsite windmill, solar energy is captured by photo voltaic solar panels, and the AOB has incorporated renewable materials from Pine Beetle damaged wood. 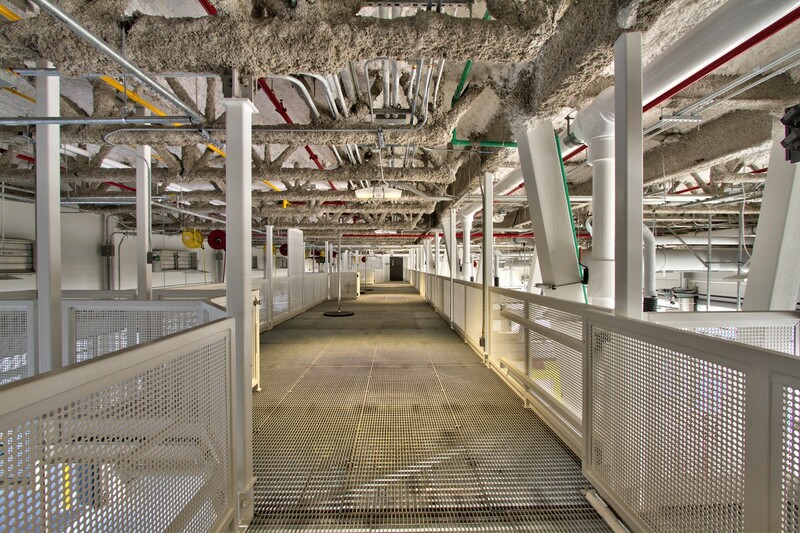 Furthermore, the AOB utilizes a geothermal cooling and heating system with 80 underground cooling wells, which pump and recycle water for the green facility. 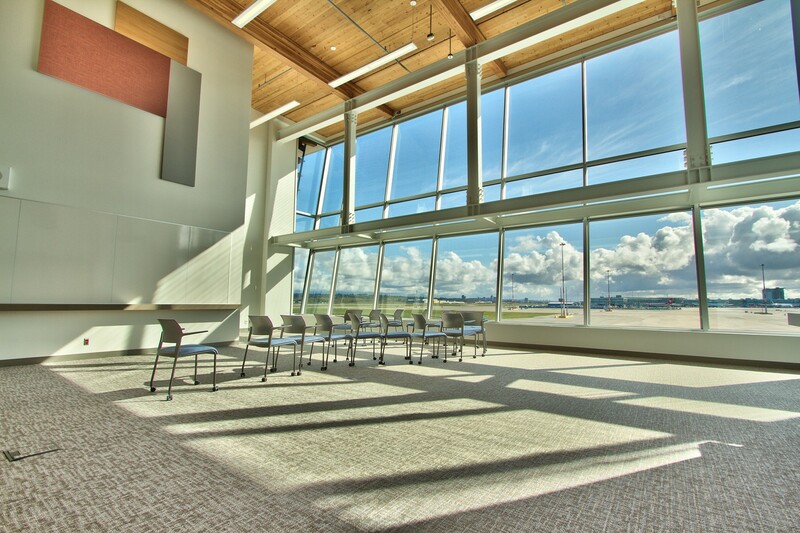 The AOB would likely be certifiable as a LEED Gold Level building upon completion of the process. However, due to its airside location, some LEED points would have been challenging such as access to public transit and site selection. The ownership and design team chose not to purse LEED certification for this project. Many re-used and recycled materials were used including 85% recycled steel and scrap metal content, Pine Beetle damaged forest products, and cooling and heating water reuse. Along with recycled steel, CLT (Composite Laminated Timber) panels and glulaminated beams were chosen for the wood’s mass, reusable material, acoustic standpoint and climate consideration. Some planned sustainable design features of AOB include: water reuse, renewable energy, materials, LED lighting, and the utilization of both solar panels and wind turbines to assist in the reduction of AOB power consumption. 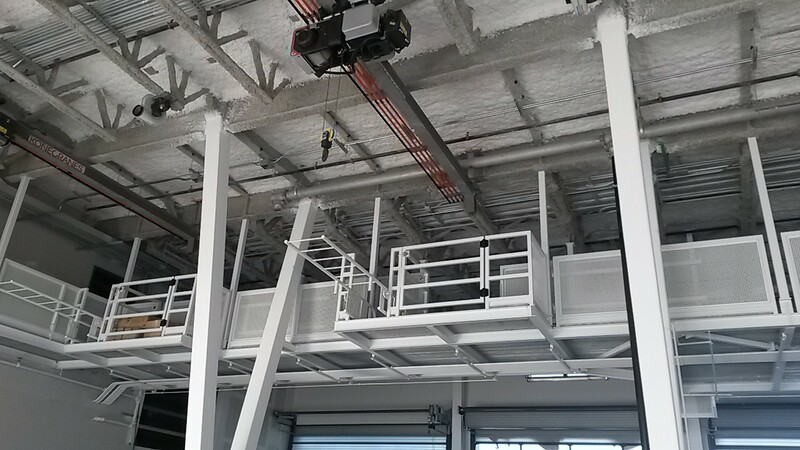 The level one storage garage features radiant heated slabs, which assist in off- setting the heat loss in AOB during the vehicles’ bay doors operations. AOB addressed the major climate response initiative by installing a hybrid of boilers and geothermal systems. The large geothermal field is located on the south side of the building, in part, making the AOB 100% independent and “off-the-grid”. 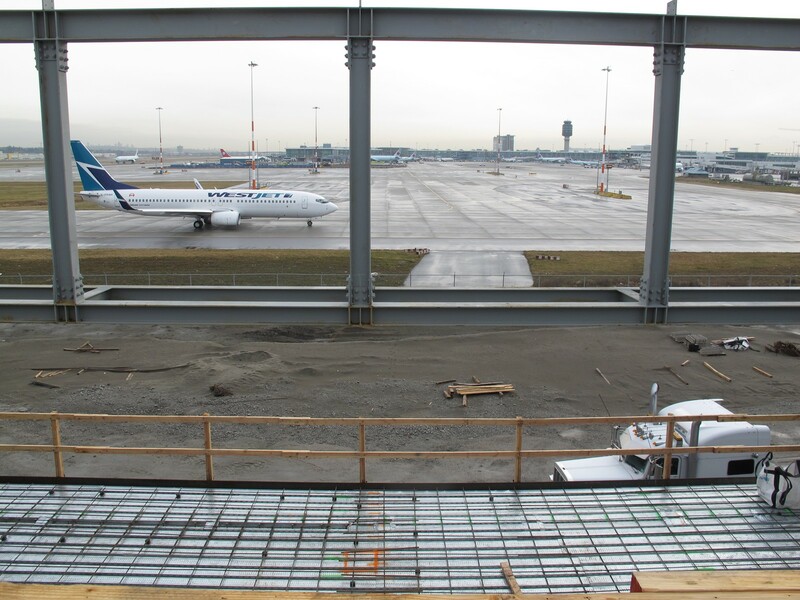 Therefore, should a natural disaster strike or a generator fail, the AOB will be a central command centre as first responders to the YVR airfield and all its stakeholders.